This one was very similar to the 6128 except that the disk drive is a 5 1/4" one !! No more cursed 3" disks that were so hard to find in 85 because nobody else was using them. The RAM is not really 512k, but rather like its brother the 6128, there were several banks used as virtual RAM disks : 5 banks of 94 k each + the initial 42 k .
There were new BASIC instructions: CIRCLE, PAINT, SCROLL, CLOCK, MUSIC, etc. and many others to control communication with the RS232 connector. 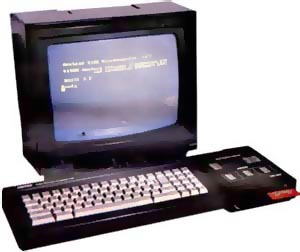 The 5512 had its own internal clock that would keep time even after the computer was switched off. Wow! But most impressive was the GUI. Yes, there was a real Graphical User Interface like Windows !! But it was slow, the Z80 could not perform miracles. Of course it was fully compatible with the other CPCs. see more Amstrad CPC 5512 Ebay auctions !